Waterwise Gardening is a work group dedicated to educating Santa Ynez Valley residents about the benefits of drought tolerant gardens. This includes information about California native plants as well as other non thirsty plants that thrive in residential landscapes of our Valley. Special emphasis is given to the utilization of the latest water-saving irrigation methods and proper selection of ground covers, shrubs and trees that are most suitable to our region. 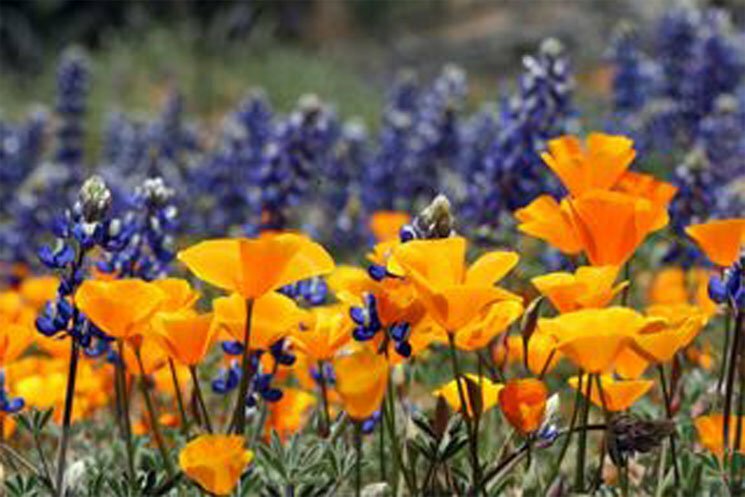 We work cooperatively with other local non-profit organizations to present free California native plant lectures. Jointly we sponsor free workshops teaching DIY techniques to transform residential landscapes into beautiful drought tolerant, water conserving gardens. We offer oak acorn planting workshops for young children with the Solvang Library and encourage planting of Valley and other indigenous oak trees throughout our valley. The committee is open to all WE Watch members interested in participating in this important environmental work. Several of the 24 species of oaks in California grow within the Santa Ynez Valley, region, including the mountains which flank the valley. However, oak research and restoration in our Valley has focused on the following trees: Valley Oak (Quercus lobata), Blue Oak (Quercus douglasii) and Coast Live Oak (Quercus agrifolia). Special emphasis has been placed on the threatened Valley Oak. The Valley Oak is found primarily in the eastern region of the Santa Ynez Valley floor. This deciduous tree can reach up to thirty feet in height and can live up to 600 years. The Valley Oak grows to be a giant of a tree. It is comfortable with a drier environment during the warm season. The massive tree produces large acorns that fall to the ground around the tree’s base in August, September or even as late as October. These freshly fallen acorns are the future trees. Due to environmental changes brought about by housing, farming, animal tending and newly introduced non-native plantings, the tree is now greatly reduced in number. It appears to be most viable in areas that have a good underground water source. One can look over the open “savannahs” and see that the Quercus lobata stands old and alone, slowly dying out. Valley oaks can also be found in more verdant areas that are irrigated or naturally receive underground water and some of these ancients look robust and healthy. Imagine this scenario — an adult or ancient valley oak, its branches intact with its own mulch lying deep and rich, its water source undisturbed, and a group of baby oaks happily growing in their mother’s protection just as nature intended. 2. Contact the Santa Barbara County Agricultural Commissioner’s Office via www.countyofsb.org/agcomm/ for information developed by our County’s Oak Specialist. For four years, she encouraged Santa Ynez Valley residents to plant and care for oaks. While the County no longer has this position it still has materials to help you. 3. Find an area for planting on your own property or a permitted public site. It should not be a site that is irrigated with sprinklers as too much water can kill oak trees. 4. Plant acorns directly into the ground. See information below. 5. If gophers, ground squirrels or deer are a problem at your site, use wire cages to protect the acorns and the young trees. 6. If practical, set up of a drip system for the initial period of growth. Oak experts have found that a healthy taproot is essential for a tree’s success. It needs to be strong, go straight down and not be disturbed. The direct planting of acorns is the surest way to guarantee a strong taproot. Don’t be dissuaded before you ever get started because oaks will grow into giants. Yes, they are very long lived and you will not personally know if you were successful in assisting an oak to reach adulthood. But you can enjoy the process of learning about and growing oaks, then sharing your experiences with others. First select large solid acorns, free of insect holes and cracks directly from the tree or from those on the ground immediately after they fall. An easy way to check acorn viability is to float test them by dropping them in a bucket of water. The acorns that float contain air pockets indicating predation and should be discarded. Acorns that sink are usually viable and ready to plant. Acorns should be planted 2 to 3 inches deep positioned on their side or point down. Where possible plant acorns in open ended cages; as with seedlings, to protect them from rodent predation. Acorns will germinate in 2 weeks or less in moist soil. The local oaks produce a strong deep tap root in search of a permanent water source. By the time the seedling is 4 to 6 inches tall the tap root is 4 to 6 feet in length. 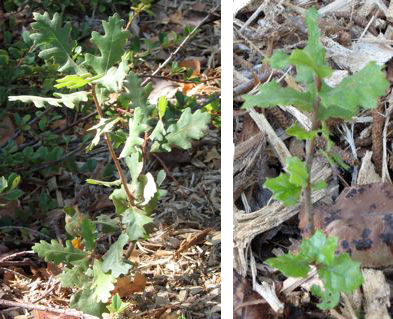 The long tap root makes transplanting young oaks difficult and dramatically reduces survival rates. Many native plants grow well in our Valley, are drought tolerant and require no pesticides or herbicides. Increasingly people are incorporating them into their homes’ gardens. who can assist you. Manzanita Nursery, on Chalk Hill Road in Solvang, specializes in native plants. The owners are very helpful and willing to help you plant native plants in groups that will create an interested palette. 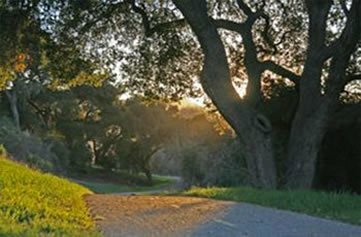 The Santa Barbara Botanic Garden and the new Santa Ynez Valley Botanic Garden at Riverview Park in Buellton are good places to see oaks and other native plants and learn how they are grown. One of the most useful websites for exploring native plants is: sbwater.org, which has extensive images of individual native plants and plants in a garden setting, all organized in a very user friendly manner. Good Luck and please send in any tips that have worked for you, so we can share them on this website.